Temple introduces students to Diamond Dollars, the university’s official campus currency, as early as their campus tours. Owl Ambassadors boast the convenience of the one card that holds both entry into a classroom building and a student’s 7-Eleven grocery order for the week. 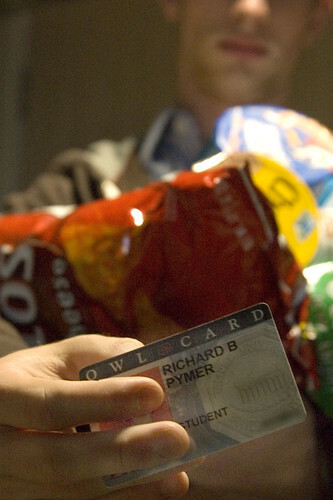 Richard Pymer uses his Owl Card to buy a bag of chips. Students often find themselves spending their Diamond Dollars on food items rather than necessities like books because they are so accessible and convenient (Roman Krivitsky/TTN). Diamond Dollars can be used in many different ways and at different locations around campus. They are a convenient way to make purchases because once students deposit money into their accounts, they don’t have to worry about carrying cash or credit cards with them. Although it is comforting that Diamond Dollars are so accessible, they can become too accessible. One night out at the Draught Horse or Maxi’s can diminish a student’s funds in just a few hours. Most students don’t think twice about spending the money, and a lot of parents carelessly put funds into their children’s accounts, thinking that Diamond Dollars are used just for books. Scott Brannan, director of the Diamond Dollars Office, said he talks to incoming freshmen and their parents whenever he gets the opportunity. Brannan said he also always explains to parents what Diamond Dollars can be used for. Alicia Rizzo, a junior nursing major, said she has no problem spending her Diamond Dollars wherever she pleases. Junior nursing major Liz Whiteman said she puts her own money into her account. Although Diamond Dollars always seem to run out quickly, if students budget their accounts and check their balances regularly, it is not difficult to save enough to buy necessary school supplies throughout the semester. Amanda Hill can be reached at amanda.sue.hill@temple.edu. New Owl Cards act as PNC Bank ATM cards and comply with the state’s voter ID law.